The developers at Sun are doing a good job of evangelizing the new features in Netbeans 5 and the upcoming Java 6. 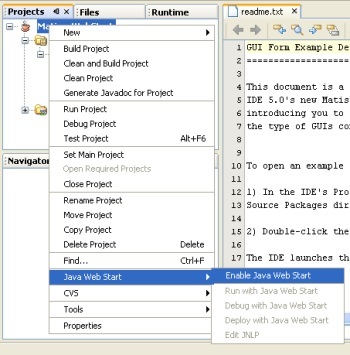 This latest Flash demo shows how to build and deploy a GUI form via Java Web Start, using Netbeans’ highly polished Matisse GUI editor. There's also a "traditional" readable version of the tutorial - I guess for those poor unfortunate souls trapped with no headphones in an open-plan office. They’ve recognized that evangelizing doesn’t just mean harping on about the benefits of their chosen deity (sorry, product); it also means placing the product (virtually) in the hands of the end-users (in this case, Java programmers) so that they can see for themselves, very quickly, how cool/useful/shiny/productive the new product really is. For this purpose, the Flash demos that they’re producing at a rate of knots are the ideal medium.